Are you looking for Spring breaks in Cornwall with family or friends? We offer short breaks up until the end of June (except for Easter and May half term). Our lovely Farmhouse sleeps up to 11 in 5 bedrooms. 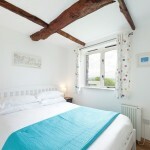 It is available for Spring breaks over weekends in March and April (from £650 for 2 nights). We just have one weekend left in May (19th May, minimum 3 nights £880) and one in June (9th June, minimum 3 nights £880). Even better our heated outdoor pool opens at the end of March for the Easter holidays! We have had some lovely feedback from guests who stayed in the Farmhouse for February half-term. They also booked some outside catering from local chef Nicky Vereker, who delivers freshly prepared food to your cottage. Nicky’s food is really tasty. 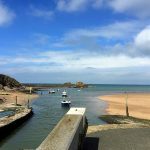 We are often asked where to eat around Bude. 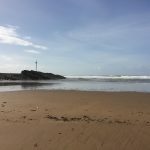 Here are some of our favourites in the Bude area. Please tell us if you have any recommendations to add to our list. We advise booking in advance in the school holidays. 1. The Bullers Arms – Marhamchurch village pub. The Bullers Arms has been very popular with our guests this summer. We have heard lots of good comments. Good value village pub. We are fans of their Sunday roasts! It is best to book in the school holidays. The Bullers is a 10 minute walk down the lane. There are no street lights so you might want to take a torch if you are planning an evening meal. Life’s a Beach is a beach cafe by day and a great restaurant at night. It has great views overlooking Summerleaze beach. Some of the best food in Bude, especially if you like fish and seafood. The best burger in Bude according to my son (lunchtime menu only). La Bouche Creole serves New Orleans style food. A bit different. Spicy but not hot. Great fish, yummy puddings. The restuarant is in the Atlantic Hotel (the pink building) on Summerleaze Crescent. Good food in another great location overlooking Summerleaze beach. The Beach is a boutique hotel on Summerleaze Crescent. Great outside seating on a nice day and good cocktails. Just down the road, off the A39 opposite the turning for Marhamchurch. The Weir is a child-friendly cafe and restaurant with a play area. Open all day in the summer, including BBQ evenings. Elements is an Italian restaurant in a hotel with great views overlooking Widemouth Bay. Good food, including a children’s menu. La Bocca is a tiny pizzeria on the Strand, serving authentic Italian pizzas and a limited range of other food. They also deliver. Design your own burger at this burger bar in Bude. Good vegetarian options also available. Mumma Bears also serves breakfast. The Barge is a cafe on a barge moored on Bude canal. In the summer the Barge moves to the end of the canal, overlooking Summerleaze Beach. Open 9-5. Cafe Bellini is a small Italian style cafe on Queen Street in Bude town centre. Cafe Bellini serves a good range of sandwiches, light meals and coffee. Get Your Veg On serve really good vegetarian and vegan salads, wraps and toasties from a caravan in the car park by the Tourist Information Office. Seating is available by the canal. Rosie’s Kitchen at Crooklets beach in Bude serves breakfasts, lunches and evening meals in the summer. Good icecream. Our kids like the milkshakes. Visit Margaret’s Rustic Tea Gardens at Northcott Mouth for delicious cream teas. Margaret serves great cream teas and cakes, freshly made sandwiches and pasties from a caravan in a pretty garden at Northcott Mouth. If you are looking for a good cocktail or a nice glass of wine try North Coast Wine in Bude. This is an independent wine merchant with a great bar and friendly staff. They also serve good coffee and soft drinks. Find them on facebook. A couple of recommendations a bit further afield but definitely worth a visit. The Rectory Tea Rooms in Morwenstow. Delicious lunches and cakes in a beautiful old house. If you are celebrating something special their High Teas are amazing (must be booked in advance). Cabin Cafe in Crackington Haven. Excellent cakes and cream teas at this friendly cafe overlooking the beach in beautiful Crackington Haven. They also do BBQs in the summer. We have had a fantastic Easter here in Cornwall, with three weeks of dry weather and a lot of sunshine. Our Easter visitors made the most of the weather. Lots of children enjoyed the pool and there were a few trips to the beach. Unfortunately our dry weather came to an end today with a hail shower at 7.30. This was not popular with my eldest, who refused to get up. “The Farmhouse had everything we needed.” “Very comfortable.” “Fantastic.” “Thanks for the high standard of the Farmhouse.” We also had a note from some younger visitors “It was really fun here in the swimming pool”. 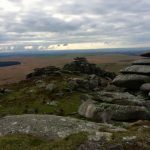 They recommended visits to Boscastle and Padstow, a walk on the coastal path and the steak night at the local pub, the Bullers Arms http://www.thebullersarmshotel.com/. The most popular beach seemed to be Summerleaze in Bude which is a big sandy beach. 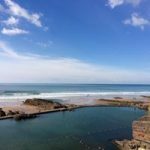 It is also home to Bude’s Sea Pool, definitely worth a visit if you enjoy swimming in the sea http://www.budeseapool.org/. Last summer we got a Labrador puppy, Toby.Toby is past the cute puppy stage now and has far more energy than we do! Over the last few months we have done a lot of walking around Bude and sometimes farther afield. 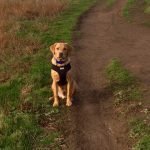 We are very lucky to live in such a beautiful part of the UK and unless the weather is really bad, walks with Toby are nearly always a good part of the day. Toby waiting for me to climb up the hill on the coastal path. 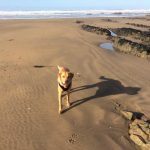 The area around Bude and Marhamchurch has lots of good dog walks, essential for a dog friendly holiday. The scenery is very varied, from the canal tow path to fields, woods, country lanes, the coastal path and the beach. Our favourite walks are along the coastal path from Bude, usually finishing with Toby having a mad ten minutes on the beach. 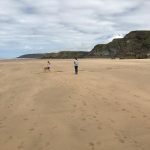 When the tide is out you can walk the long stretch of sand from Crooklets to Northcott or Sandymouth. Walk back along the coastal path and take in the stunning views. In the other direction, explore the breakwater in Bude if the tide is out and then take the coastal path over Efford Downs towards Widemouth Bay. The scenery in this direction is more rugged and dramatic. Carry on through Upton and pick up the tow path back to Bude or walk to Widemouth and back. There are plenty of cafes to re-fuel in Bude! If you would like to explore a bit further afield, the coastal scenery around Tintagel and Bossiney Bay is particularly beautiful. There is a car park at Bossiney Haven from where you can walk down to the beach which is well worth a visit at low tide. Or you can follow a circular walk from here to the spectacular Rocky Valley. 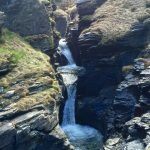 Try the National Trust’s walk https://www.nationaltrust.org.uk/tintagel-old-post-office/trails/rocky-valley-walk. 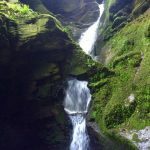 There are walks in the woodland around St Nectan’s Glen with its waterfall http://www.st-nectansglen.co.uk/. 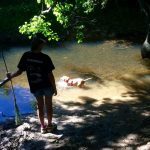 These walks all have enough to keep children interested. For a longer walk you can follow the coastal path from Tintagel to Rocky Valley and back along the road. We are at the top of the hill so it is downhill at the start for most of the walks from Marhamchurch, but unfortunately upwards on the way back. If we are walking with our youngest child (aged 5) we usually cheat and park the car in the village. From the car park it takes around 45 minutes to get to Widemouth Bay and about the same into Bude. Widemouth is over the fields and a bit hilly. Bude is along the tow path which is nice and flat with plenty of distractions for tired children. In Marhamchurch itself there is a pretty walk along the river, the Hele Valley trail. Toby is particularly keen on a quick dip in the river. At Blackrock beach, open to dogs all year round. 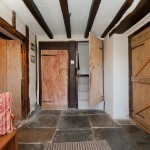 We have three cottages for two, all refurbished over the last two years. Our cosy cottages are located away from the family cottages and the pool, overlooking our fields. 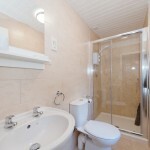 Each cottage has a double bedroom, shower room and living area with fully equipped kitchen. We offer short breaks in our cottages for two all year round, except July-mid September. May and June are a good time of year to visit Cornwall, before the summer rush. There are long evenings, glorious sunsets and the coastal scenery is particularly beautiful with wild flowers. Our rural site is well located if you want to explore Cornwall. It is less than 10 minutes’ drive to Bude and Widemouth Bay. We are a few minutes from the A39. Spring is in the air – hopefully. As I write this Storm Doris is howling round the house, bringing gales and lots of rain. However, we are now into February and this week I have seen lots of snowdrops and a few primroses. 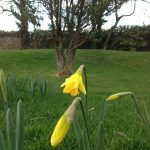 The first daffodils are out, although the wind will probably flatten them tonight. It definitely feels warmer this week when I am walking our puppy (who is now in the naughty toddler stage), despite the wind. Our hens have started laying again as well. Unfortunately, we had a visit from the fox at the end of November. The cheeky thing had three of our newest hens. The others went on strike, except for one who laid an egg every day all through December. 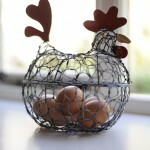 However, now the days are getting longer we are getting more eggs each week. Good for baking! While we are quiet we are busy trying to fit in work to update the cottages, with the help of our local builder /handy man and his daughter . They have started taking off the rendering on the outside of our lovely Farmhouse, revealing a lot of old stone wall which we are re-pointing. This is a very time consuming and painstaking job, not helped by the winter weather. We are also re-fitting bathrooms in the Farmhouse and Manor, doing some decorating and laying new flooring. This week I booked the local pool maintenance company to re-open our pool at the end of March, ready for Easter! Only a couple of months to go now and hopefully we will see some sunshine. If not, you can always hide in the hot tub. 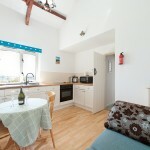 Self -catering short breaks near Bude, in North Cornwall. We offer short breaks in our self-catering cottages throughout the Autumn and winter (except the family cottages for the week from 22 October). Our cosy cottages are well-equipped and ideal for a weekend away with friends or family. There is lots to do on site with our hot tub, tennis court, games room and play area available. 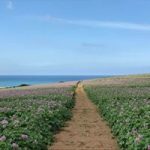 We are close to the beautiful North Cornish coast so you can enjoy walks on empty beaches at this time of year or explore the coastal path. 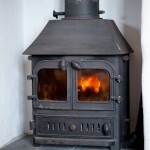 Our three largest cottages have log burners, perfect for cooler evenings. Hoorah! Is summer here in Bude, or nearly? 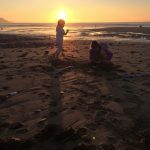 We’ve had some warm weather this weekend and a couple of trips to the beach, including a dip in the Bude sea pool at Summerleaze beach and the first body boarding session of the year for the kids yesterday. Looking forward to plenty more. We had a nice lunch at the Olive Tree by the canal in Bude today, followed by a walk down the canal and across the bridge to the breakwater. If you are feeling energetic you can hire a pedalo or a rowing boat to explore the canal in the summer. There are lots of places to eat along the wharf and we are waiting for Bude’s first restaurant in a barge to open as well. At the end of the canal if the tide is out you can either cross over the bridge to Summerleaze or walk over to the breakwater. 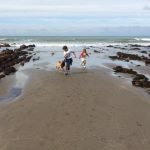 The breakwater is one of my favourite spots in Bude and it is always popular with the kids, who love scrambling over the rocks and exploring the pools. It is fun in all weather – good for watching the waves when the sea is rough and the tide is in, provided you don’t get too close! However today the tide was way out so we were able to get down onto the sand on the other side of the Breakwater from Summerleaze beach. It was almost empty, a great stretch of sand to run around on and lots of anemones in the rock pools. We’re looking forward to summer 2016 and hopefully some better weather, spring flowers and maybe even blue sky and sunshine. Our pool will open late March ready for the Easter holidays. The family cottages are getting busy for the school holidays but we do have some availability (see the dates below or check our online calendar). We have plenty of availability for couples and short breaks or longer holidays for bigger groups outside the main school holidays. 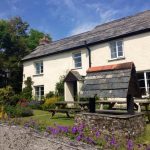 We offer short breaks (minimum 2 nights) outside July – mid September and the main school holidays. 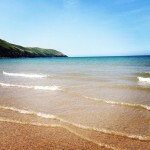 May half term 27 or 28 May: Pound (sleeps 4, £890), cottages for 2.